Garage Improvement: Guess whose garage this is? About garages, being organized, and related things. 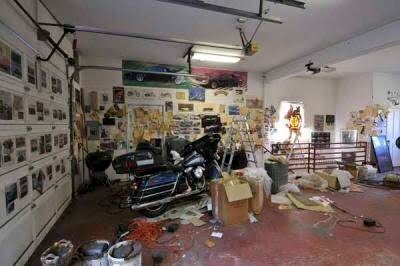 Guess whose garage this is? Would you believe Jay Leno? Most people are familiar with the shop containing his huge car collection, however Jay Leno's personal garage seems to be just as messy as the average homeowner, filled with broken down furniture, piles of clothes and old memorabilia. On the DIY Network show Garage Mahal, host Bill Goldberg worked with our friend and supplier Garage Envy to totally transform it into an amazing showplace. Unbelievable "his" and "hers" garages complete with technology straight out of a James Bond film! You can see the DIY Network Garage Mahal episode here.